[This article was first published Feb. 5, 2004. Your project is done. The client is happy and their check has cleared the bank. It's time to trash that old project and get ready to tackle something new. As your client was walking out the door for the last time, they said, "This was really great. And, in six months, if I get the budget, I'm going to come back here and re-edit some new pieces." Great. Now, instead of trashing everything in sight, you need to archive your project just in case they come back. Well, archiving a project is a lot easier if you take time to get it organized in the first place. There are lots of different ways to organize a project. This is my system. It works for me. And, if you don't already have a system, this will work for you, too. If you are serious about your editing, you'll have at least two hard drives: one for the operating system and Final Cut Pro (called the "Boot Disk") and a second hard disk to hold all your media. 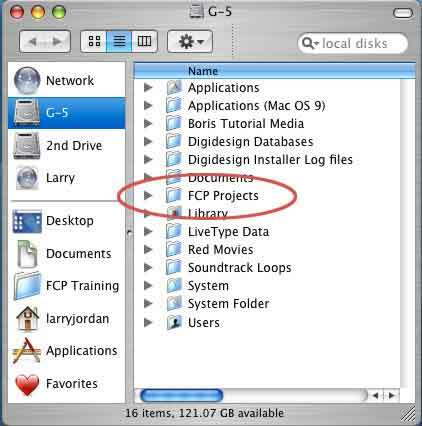 On your boot disk, create a folder called, "FCP Projects." This folder will hold all your non-timecode-based project files. If you are the only person using your computer, you can put this in your User folder, or anywhere else you care to store it. If other people also use your computer, store this folder at the "root" level, that is to say, at the same level as Applications and User, because that way, everyone can have access to the projects stored in this folder. On your second drive, create a folder called, "FCP Media." This folder will store all your timecode-based media. Now, open Final Cut Pro, and go to Final Cut Pro -> System Settings and set the Scratch Disk to the new FCP Media folder you just created. When FCP captures media, it automatically creates a new folder inside FCP Media > Capture Scratch named after your project file. This makes it VERY easy to find captured media on a project by project basis, because it's all sorted by project inside a single, FCP Media, folder. 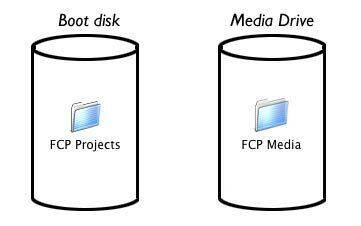 If I am creating a project that will fit to a single hard disk, I will create only one "FCP Media" folder. If the project will require multiple hard disks, I create a folder called "FCP Media" on each hard disk, then I point the Scratch disk to each FCP MEdia folder on each hard drive (you can only have one scratch disk on a hard disk). Final Cut Pro version 4 allows up to 16 scratch disks. Best of all, I only need to create the FCP Media folder once. After that, the automatic filing of Final Cut keeps all the different media files for all my different projects in their own separate folders -- all in one place. The whole process takes me two - three minutes at the start of each project and now I'm ready to start work. Here's the drill: all timecode-based media gets captured and stored in the FCP Media folder, on the second hard drive. 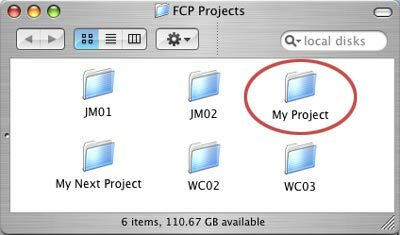 All other files -- graphics, music, sound effects, memos, schedules, everything -- goes into the FCP Projects > My Project folder on my boot drive. Playing music or sound effect files on the boot disk is generally not a big deal because the bandwidth they require is small compared to video. Critical to the whole archiving process is that as soon as a production tape is shot, I give it a reel number and write it on the tape cassette. All my tapes have UNIQUE reel numbers. For my personal tapes, I simply number them. For professional projects, I give them a project name and reel number: for instance, "WC04_01," where the project name is to the left of the underscore and the reel number is to the right. Then, I am religious about making sure I add the correct reel number to every clip that gets logged or captured into Final Cut. And, remember, because of how we set the scratch disks, all captured media gets stored in the FCP Media folder on the second hard drive. Another thing I am religious about is bringing every clip I plan to use into the Browser, rather than dragging it directly from the desktop to the Timeline. This means that every clip in my project shows up in the Browser. Using this organizational system, ALL the elements of a project are in one of two places: the Media folder or the Project folder. When the project is done and everything has been output and approved, you are ready to archive. The question is, "What?" Again, here's my suggestion: Don't archive media. That's what your original camera source tapes are for. They are small and last for at least 20 years. As a side note, when I was working in broadcast with 1" and 2" tapes, I was taught to NEVER store tapes on their side. Always store them on edge. For the short-term, how they are stored won't make any difference. Longer-term, however, storing tapes on edge decreases the effect of the earth's magnetic field and any potential oxide shift due to gravitation pulling on the oxide of your tapes. I'm sure that tape stock today is better than 20 years ago. And the size of tapes and strength of the signal also tend to minimize these adverse effects. All that having been said, I still store all my tapes on edge and away from heat and light. Oh, and I make dubs of all my most important work every 20 years or so. So, if we aren't going to archive media, what are we going to do with it? 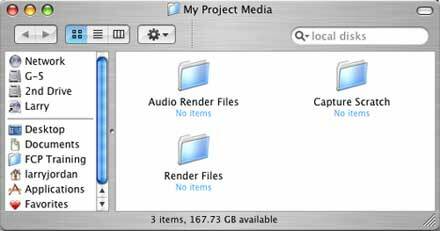 The answer is simple, we simply grab the "My Project Media" folder inside FCP Media on the second drive and trash it! Why? Because if every clip you used is in the Browser, AND if you assigned every clip a reel number, you can easily redigitize your entire project by selecting the clips you need in the Browser and going to File -> Batch Capture. Final Cut will ask you to insert the source tape reel, then merrily recapture all the missing media. Best of all, recapturing when you need the media means that you can take advantage of all the improvements in codecs and Final Cut that occurred between the time your project ended and when you need to recapture. Here's a second side note. Some people may still want to archive their media on something other than tape. What should they use? Well, a friend of mine uses removable hard disks. While really expensive, this has the advantage of keeping everything in a digital state. Just connect the disk and he's ready to edit. Short-term this is a good solution. Long-term, it isn't. There's just no assurance that the same storage media will be around and able to be hooked up in ten or twenty years. I mean, look at all the old gear you've got cluttering your garage that used to be state of the art -- and that stuff is probably far less than ten years old. Others may want to archive to DVD. This is OK, as long as you understand the limitations. First, DON'T archive your media as an MPEG file. While your file sizes shrink, so also does your ability to edit them. In spite of the marketing hype, MPEG is a distribution format, NOT an editing format. Second, remember that a one hour Beta SP tape holds about 60 GB of media. A DV tape holds 12 GB. A DVD that you can burn only holds 4.2 GB. So it will take three DVDs to store the contents of one DV tape, or 12 DVDs to hold one Beta SP tape. Third, if you still feel compelled to store your media on a DVD be sure to create a DATA DVD. This keeps your media in a pristine digital state that is available for editing. Just copy your digital files from your hard disk to the DVD as they are, without additional compression. So, if we don't need to archive the media, what gets archived? Everything in the FCP Projects > My Project folder on your boot disk. Remember, this is the folder that stores your FCP Project files, your music, sound effects, graphics and every other non-timecode file related to this project. Because everything is all in one place it is a very simple matter to drag this folder to a blank CD or DVD (depending upon how much space you need) and, presto!, you've got a complete backup of everything you need to re-create your project at any time in the future. No muss. No fuss. And no trauma trying to track everything down at the end of a project. This tip is from "Larry's FCP Newsletter," a very cool FREE monthly Final Cut Pro newsletter -- subscribe at Larry's website: www.larryjordan.biz. Larry Jordan is a post-production consultant and an Apple-Certified Trainer in Digital Media with over 25 years experience as producer, director and editor with network, local and corporate credits. Based in Los Angeles, he's a member of both the Directors Guild and Producers Guild. Text copyright 2004, by Larry Jordan. All rights reserved.